The man was trying to convince us that all three of us would fit on his tiny motor scooter, backpacks and all. Moreno and I had hitch-hiked a hundred kilometres already that morning. We’d caught two good rides quickly and easily – one in the cab of a truck, another on the back of a pick-up – and were now only eleven kilometres from our final destination. Moreno cast one dubious glance at the man’s scooter, stepped past it and flagged down a passing truck. After exchanging a few words with the driver, we both clambered up to perch on top of the cargo, just behind the cab. It was wonderful to be sitting up there above the world in the bright afternoon sunshine. Moreno and I were just congratulating ourselves on our good fortune, when people started yelling at us. The man with the scooter told us to get down, and the truck driver started gesturing frantically in the mirror. Turning, I saw the problem: a soldier had appeared by the side of the road, and he didn’t seem too pleased to see us there at all. 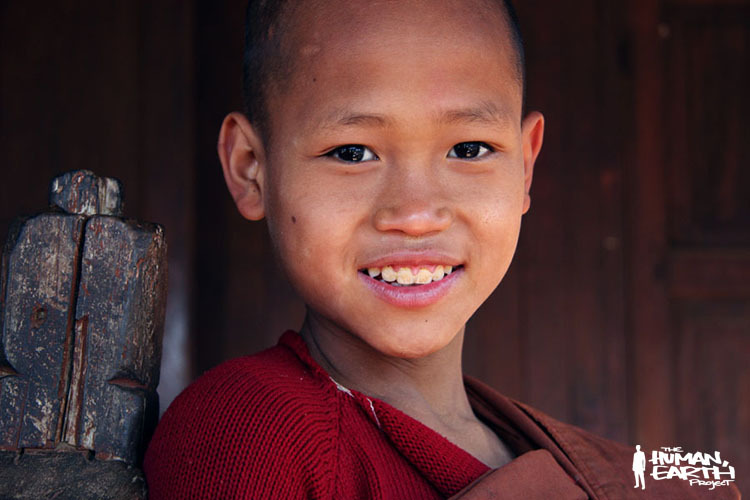 Almost five years earlier, I’d photographed a young novice monk in a small village monastery. Moreno and I had returned to the monastery hoping to find the boy, only to be told by his father that he now lived and worked in another village a hundred kilometres away. We didn’t realise, of course, that the boy’s new home was in a heavily militarised area, where foreigners were treated as objects of great suspicion. Our visas having expired the day before, an encounter with the local authorities was the last thing we wanted. The soldier insisted on accompanying us to the local police station. By a stroke of great fortune, at the very same moment, Moreno and I both completely forgot how to speak English, or how to understand even the simplest of hand gestures, so we smiled, nodded, and ambled off in the opposite direction. We knew we’d earned only a very temporary reprieve, and our only hope was to get out of that one-street town as quickly as possible. We walked around the first bend, and stuck out our thumbs again. Within two minutes, a man on a motor scooter pulled onto the shoulder. If he was offering to take us both on his bike, this time we’d try: we were desperate to get away. Then I saw the IMMIGRATION badges on his bike, and the symbol of a gate guarded by two crossed spears. This was the man who held the spears, and we’d just come up against them: there was no walking away this time. Speaking excellent English, the man introduced himself as the head of the local immigration office, and demanded to know what Moreno and I were doing in the area. Believe it or not, Moreno and I can be quite charming when the situation demands it, and we befriended the officer as best we could. Rather than checking our documents or ejecting us from the area immediately, the man softened, and allowed us to continue to our destination. There was just one little catch – we would remain under the watchful eye of the local police, who would accompany us to our destination, and ensure we stayed no more than two hours in the area. A phone call was made, and two more men on motor scooters arrived almost immediately. One had the appearance of a high-ranking officer – stern-mannered, with a black leather jacket, a gold watch, and a military buzzcut. The other, quite simply, was a buffoon. Moreno and I were directed to get on the back of their bikes, and they would take us to our destination. I climbed on with the officer, and we shot away immediately. Moreno climbed on with the buffoon, who stopped to buy betel nut, then circled back after dropping it in the middle of the road. He ordered Moreno to drive, so that he could sit on the back and chew his betel. By this time of course, they’d long since lost us, and Moreno had no idea where he was going. Neither did his betel-chewing buffoon, as it turned out. After Moreno shot straight through the village where the officer and I were waiting, the buffoon took control of the bike and sped away in the wrong direction. He may have continued indefinitely, if he hadn’t blown a tyre. I’d seen their bike go past, but the officer hadn’t. He was still watching the road into the village, wondering why they were taking so long, while I was trying to communicate the fact they’d passed fifteen minutes earlier. When at last he understood, we set off in pursuit. We finally caught them, replacing the tyre tube by the side of the road. When all four of us finally began the long ride back to the village, the buffoon ran out of fuel, and we were stuck waiting by the side of the road again. When we got back to the village, Moreno and I found ourselves filming in a military area entirely without permission, under the suspicious and impatient eye of the two policemen. With only thirty minutes to find the boy, and no clues from the locals, there was little we could do. The sun sinking fast, we scratched the boy from our list – our first failure in Myanmar, and a small price to pay for regaining our freedom.